One of the big areas of confusion about Gandhi, are his views on technology and machines, and how they relate to his ideals. This angle on Gandhi, like the food-chain, finds building-blocks with duty, varna (social ordering), trusteeship, his vows of non-possession and non-stealing, education, and much more. Indeed, to paraphrase one of our great American sages, John Muiri, it is difficult to pull out a single subject in Gandhi’s thought, without finding that it is hitched to everything else. At age 55, Gandhi returned to India in 1915, after nearly 27 years abroad in UK and South Africa. Industrialization had dawned heavily in the western nations, noisily processing the spoils of resources and labor from the colonies. His two community experiments in South Africa had shown him the value of communal living in pursuit of high ideals, bodily labor for the common good, simplicity, austerity, and a close relationship with Nature. He spent a year in political silence, traveling all around India, observing conditions. In his day, 90% of the population lived rurallyiii, today the statistics say 70% .iv Villagers, for the most part, were in deplorable poverty. He felt great anguish, and sought through every means he could muster, for the rest of his life, to improve their lot. He knew, that the India of his dreams could never thrive, unless the welfare of the masses, and therefore village life, was priority #1. It was a contradictory image from what young, English-educated India was trained to desire. Urban life, for a few, was opulent, elite, western-oriented, and lived off the toils of the village, without adequate renumeration of any kind. Rural life was seen as a pit of in-sanitation, human ignorance, material poverty, and social rigidity. Over a hundred years of British style education, made young, elite, India view their rural brethren as primitive, and the life of the farmer, as dirty. 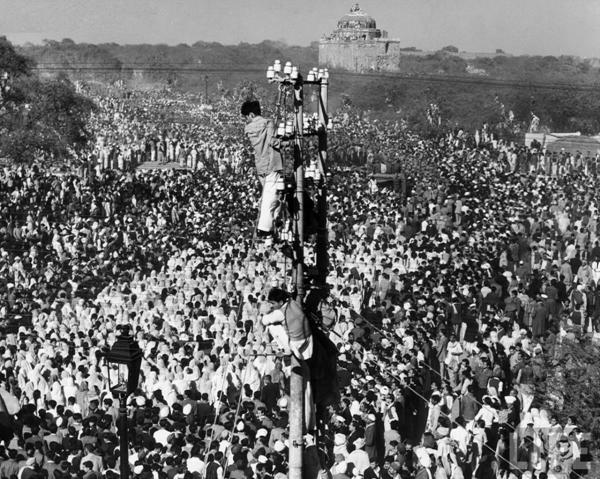 Remarkably, in 33 years, Gandhi succeeded: the necessity of rural reform was recognized and taken up in earnest by thousands of sincere co-workers. With the assistance of the independent Congress Party, he placed a vision of his ideals for genuine nation building into nearly every corner and hamlet of India. He called his vision – “Gram Swaraj” (Village Self-Rule). He gained the cooperation, enthusiastic support, and goodwill of the masses. They were ready to help usher in a new dawn in India, that would include their interests as well. His personal vows of non-possession, his love of simplicity, his austerity, and his outspoken warnings of the dangers the masses of India would face if industrialization came to India, caused him to be regarded as anti-machine and anti-tech by the elite. The misunderstanding was news to him. His secretary, Pyarelal, recorded one conversation with Gandhi, then, age 55. 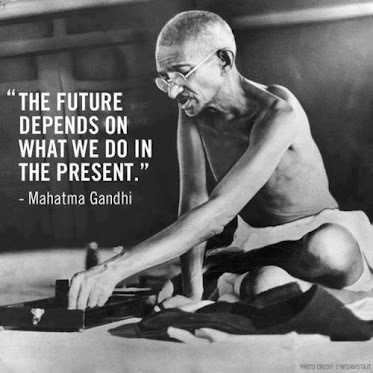 Gandhi saw the tide swelling in, a tide which is now well over our heads in the US, as we live with 20% unemployedxiii, homes foreclosed, dependents, neighbors and communities afflicted, with nature stripped and destroyed world-wide, by corporations that seek profit – above any and all human or environmental considerations. Never has history known before or since, such a massive flower of human awakening, that Gandhi’s village work represented. As political power and position became secured, there was a blatant rejection by India’s elite and leadership of Gandhi’s ideals, his careful nurturing of village economics that would sustain life, in favor of the very models that had destroyed India in the first place, only with Indian masters, instead of British. This, in retrospect, is perhaps one of the most historically criminal acts; the education received at the hands of the British Raj had blinded the elite. Gandhi’s name and ideals were political fodder for over 30 years. Power secured, they were thrown away. He is only a token “Father of the Nation”. We can all see the condition of India todayxiv. Had power followed through in carrying out the vision and plan he so carefully nurtured, by example, India would have paved the way for a more just governance for our species, we would have been on the trajectory to world peace. It was Gandhi’s love for all human beings, his desire for social justice that enable him to understand the duty of the state and industry, their roles in supporting human life and creating a just economic system. It has been said that “God created villages, man made cities.” In applying these ideas to our strapped times today, we find gentle solutions, that we naturally turn towards, that work. i“When we try to pick out anything by itself, we find it hitched to everything else in the Universe.” John Muir. My First Summer in the Sierra , 1911, page 110.
iiTendulkar, D.G.(1920). 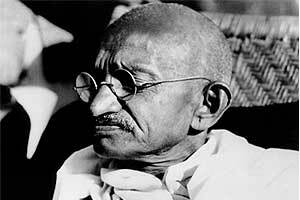 Mahatma: Life of Mohandas Karamchand Gandhi. Vol.3 : 221.. Ministry of Information and Broadcasting, Government of India, New Delhi. iii1911 Census on population by towns and villages. vGandhi, M.K., Vyas, H.M.~(compiler) (1962). Village Swaraj: 22. Navajivan, Ahmedabad. vi Gandhi, M.K. (1924). Young India: November 13.
vii Gandhi, M.K. (1924). Young India: November 13.
viiiTrusteeship – to be expounded upon. ix Gandhi, M.K. (1940). Harijan: January 17.
x Gandhi, M.K. (1924). Young India: November 13.
xi Gandhi, M.K. (1940). Harijan: September 29.
xii Gandhi, M.K. (1946). Harijan: August 25. Also Published in: King, T. (Editor & Publisher). (2014). Neighbors. September – October. No. 130. Clarifying Gandhi: The Machine and the Village. pps. 14-15, 36-37. PK Willey, Ph.D., is an American, a Gandhian scholar, author and entrepreneur, who has delved deeply into Gandhi's Earth Ethics. Willey seeks to enhance philosophical discourse around the world where globalization has altered ethical values, particularly in the USA. Willey finds Gandhi's ideas, thoughts, and example, to be invaluable in this effort. Currently, besides numerous articles and book projects,Willey is developing a new framework for qualitative research that employs Earth Ethics, guided by a Gandhian compass and Weibust's Transformative Paradigm.